On Saturday 24th of November Carl Cox & Eric Powell's Mobile Disco landed in Canberra on Saturday 24th November at the stunning lawns of the Australian National Botanic Gardens. Carl Cox & Eric Powell did what they do best! Digging deep through their extensive record collections and picking out their favourite soul, funk, disco tracks that they were brought up with and tracks that have influenced them over the years. It’s a known fact that they have many gems in their archives! 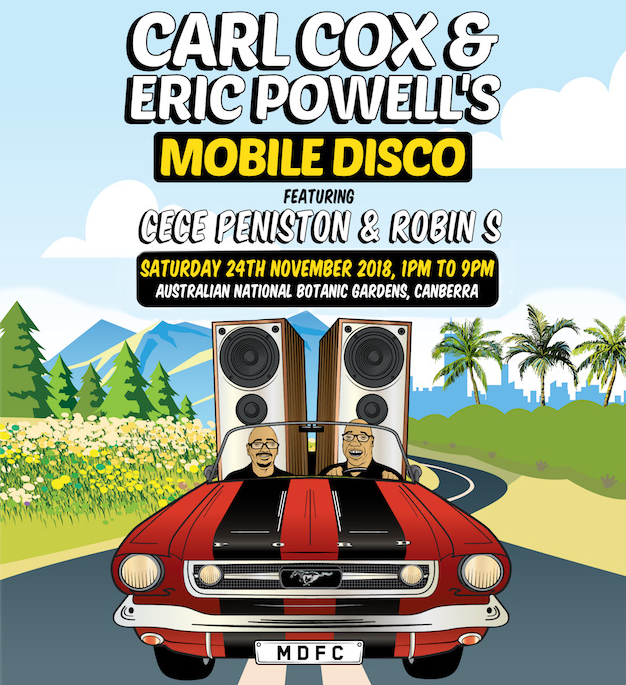 The ‘Mobile Disco’ began in Melbourne, Australia with 150 of Carl & Eric’s closest friends. It’s gotten bigger each year with more friends & jazz, funk and disco loving fans coming along for the ride. ‘Mobile Disco’ is now a ‘Must Attend’ Australian tour playing to sold out boutique shows at some of the most picturesque locations across Australia. Both Carl Cox & Eric Powell will be entertaining the crowd from the start of the day til the end and are also excited to announce that special guests: CeCe Peniston, an international icon and the icon behind 'Finally' and Robin S, a chart-topping successful singer and songwriter best known for her classic hit 'Show Me Love'. Presented by Kicks Entertainment, Spilt Milk is a summer’s day event, bringing the best in artisan street food and drink, cutting edge music and experimental art and culture in Canberra, taking place within the tree lined landscape of the iconic Commonwealth Park. The Parliamentary Triangle was transformed into Bavaria on Saturday, October 20 when Oktoberfest Parklands returned to Canberra after its huge debut in 2017! 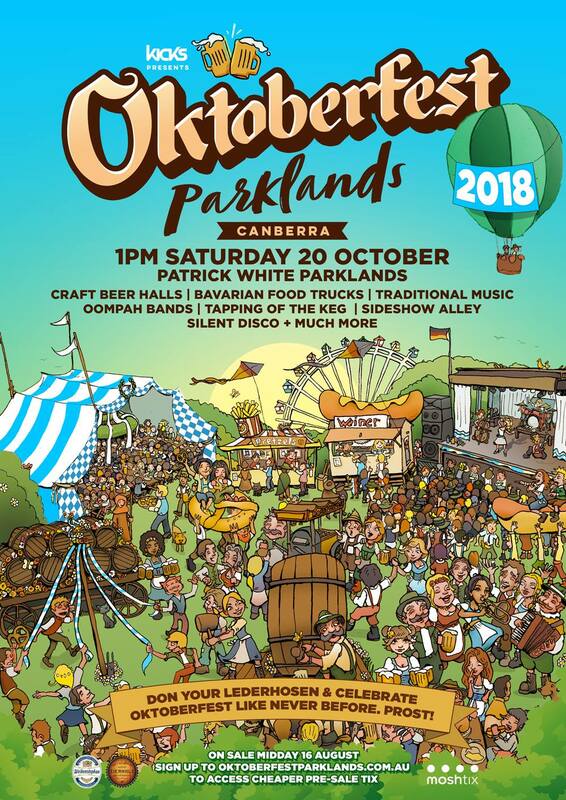 In 2017, more than 4,000 people dressed in their finest lederhosen and dirndls descended upon the lakeside parklands of Patrick White Lawns and once again Oktoberfest Parklands brought the very best bier, kultur, kostümes and cuisine to Canberra for the one-day event. In 2016 the inaugural The Commons Street Feast attracted over 50,000 Canberrans across 10 days of pure, glorious indulgence! Returning for 2017 from 30 November – 10 December in Commonwealth Park, The Commons brought over 20 of Australia’s most mouthwatering food trucks, dedicated craft beer and wine bars, the completely insta-worthy Pimms Garden, plus a whole host of events, entertainment and installations to satisfy your inner most gluttonous desires. The Commons Street Feast is proud to partner with Her Canberra, Hit 104.7 and Visit Canberra, and excited to support OzHarvest as the 2017 charity partner. Oktoberfest Parklands transforms Patrick White Lawns in the Parliamentary Triangle into a massive lakeside Volksfest celebration with Craft Beer Halls, Bavarian Food Truck Village, Oompah bands, DJs, traditional dancers, side show alley, rides and amusements and a whole host of other entertainment for you und dein Freunden! Think Kranski, Pork knuckles, Pretzels and steins of beer (plus German wines & other drinks of course), all while singing a German Oompahpah in a huge Beer Hall and across the beautiful waterside parklands just minutes from Civic. Gluttony never tasted so good as the inaugural The Commons Street Feast assembles your every guilty food pleasure into a 10-day summer celebration of street food. From 9 – 18 December, Commonwealth Park hosted over twenty of Australia’s premier food trucks, artisan chefs, craft brewers and much more for the ultimate feastival. At the time, Foreshore was Canberra’s biggest music festival running sold out shows from 2007-2012. Well known for bringing the biggest International and Australian Pop, Indie bands and Electronic DJ to the capital. Warehouse festival was Canberra’s first winter musical festival, which brought the biggest and best names in EDM, pop, indie and dance talent from international superstars to homegrown locals.